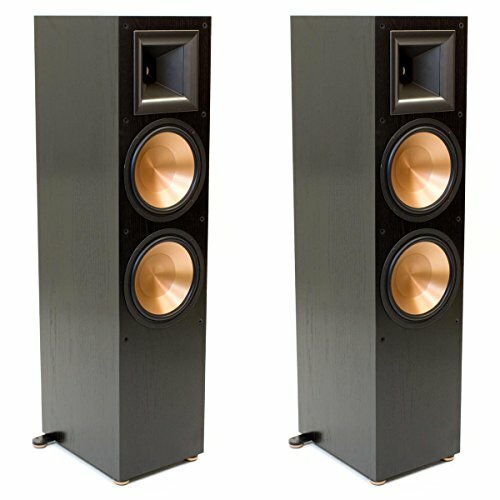 Purchase this bundle and receive two Klipsch RF7 II | Black Reference Tower Speakers. Authorized Dealer. New and Improved Now in its fifth generation, Reference II speakers have even more content and superior sound quality for you to enjoy. You'll find re-engineered drivers throughout combined with a new crossover system that will capture your complete attention and excite your emotions. Improved cosmetics, including black metallic finished baffles, cerametallic woofers, new logos and feet, redefine the look of "big sound" throughout the line. Four Laws of the Klipsch Universe Beginning in 1946, company founder, Paul W. Klipsch believed four principles to be the foundation for great sound. Together, these four design principles-high efficiency with low distortion, controlled directivity, flat frequency response, and wide dynamic range-have and always will be the foundation for our stunningly powerful and precise sound. Purchase this bundle and receive two Klipsch RF7 II | Black Reference Tower Speakers. Authorized Dealer. Titanium tweeter with linear travel suspension-trickle-down technology from our flagship Palladium Series-provides an open, natural sound, making you feel as if you're in the studio with the recording artist or on the set of a film.